We have always had a Forms converter and a non-forms converter as 2 different products, but some potential clients said we could make it clearer. So as part of our site revamp, we have separated out the 2 different products and this blog post is to clarify this. We see TWO different markets/use cases for our converters (hence TWO different products). There is a large market for users who want to view documents online. 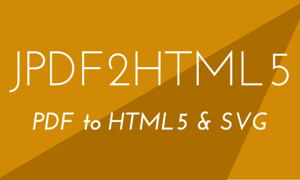 They want accurate document display and HTML5 is merely a means to this end. They are often looking to replace Flash as a solution. This is provided by JPDF2HTML5. In this case we would rasterize any forms and not display dynamic XFA documents. There is often a workflow requiring the data to be return via an internet connection or updated in the original file. This is the group who would also use Acrobat Reader in Google and Adobe LiveCycle. Neither of these are options in 2016. This is a much smaller, premium marketplace with more complex requirements. 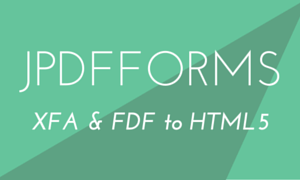 We have JPDFForms to provide this functionality. Both are on our website with free trial versions and online demos, and we hope that whichever market you are in, you will consider our offerings. that just provided the Jpdf2Html5 online converter, AFAICT.